This will show you how to quickly get Feather up-and-running so your readers can access your premium content. 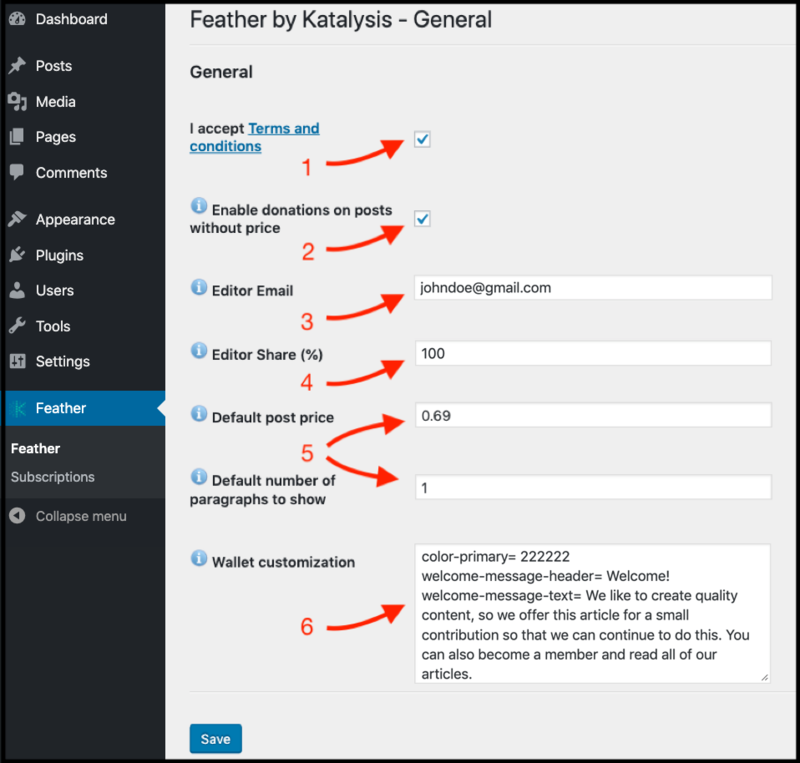 To get your articles behind the Feather wallet, it only takes a quick set-up to customise how you want your wallet to work for you and appear for readers. Open Feather in the left panel, and please read & accept the Terms & Conditions. Select "Enable donations on posts without price" if you want your readers to be allowed to donate to you under articles you've published for free. If you leave this unchecked, you will not be able to receive donations. Enter your email address (note: this is the email address we will store as a communication end in regards to your bank details, cash-outs and article statistics). Fill in the "editor default share", which is your share (%) of each payment made towards purchasing your content by your readers (this should be entered as 100% if you are the only owner of your articles). Set your "default post price", which means that every article you publish that you want readers to pay for will be set at a default price. Next, you can fill the number of paragraphs to show by default as a teaser before your readers pay for your article. If you want to change these settings for a selected article, this can be done in the article's editorial setting. - Change the color: " color-primary= FF0000 "
- Change the welcome header: " welcome-message-header= Welcome! " - Change the welcome message: " welcome-message-text= We like to create quality content, so we offer this article for a small contribution so that we can continue to do this. You can also become a member and read all of our articles. You should be all set up now! Next, you just have to publish some articles and let readers contribute to you.